Wine is meant to be shared with others. 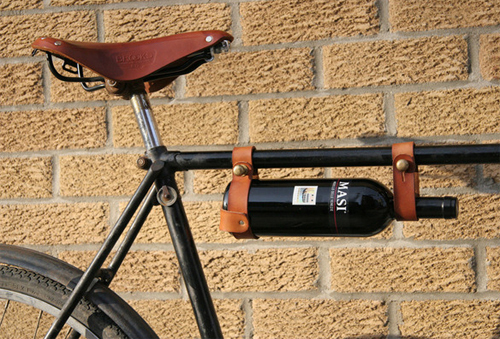 And that means getting it to these ‘others.’ For the (apparently only on a men’s) bike-bound, the Bicycle Wine Rack looks to lend a hand. Just don’t slam on the brakes while cycling to your destination. Perhaps the whole shebang would slide forward and the wine bottle would stay nestled in the holder, or perhaps the inertia will carry the wine and bottle forward leaving the base holder behind. Perhaps the neck end would then twist so as to stall the bottle from smashing to the ground. Perhaps it would work. For $35 you can find out. Recommended for Two Buck Chuck. awesome! how could I live without?